These prices refer to our cheapest airport parking products available. The 'per day' price refers to the cheapest product available at Edinburgh Airport and the 'per week' price refers to the cheapest product available at Edinburgh Airport, both within the next 61 days, at 12am on 22/04/2019. Treat your car to a holiday too with one of our approved, trustworthy car parks at the airport. Starting at £33.91 per week, our car parks are lovingly hand-picked by us to offer the best selection of affordable, efficient airport parking at convenient locations near every major (and some minor) UK airports. Your faithful motor will have fantastic views of quality fencing, regular patrols and hundreds of other safe and happy vehicles. Booking with us can even save you up to 70% off what you'd normally pay, what's not to love? Tell us where you're flying from to see which car parks are available at your departure airport. We serve all major airports in the UK and even some minor airports, so we're pretty certain you'll find something to suit you. To find your airport click on the appropriate area. Parking your car at busy airports like Gatwick, Heathrow and Manchester doesn't need to be a stressful or expensive experience. In fact, we've carefully designed each of our car parking packages to be an easy and affordable walk in the (car) park. We don't like technical jargon here at Holiday Extras, so we're going to keep this simple and as clear as possible. Park your car in the car park a fair distance away from the airport and ride in the transfer bus to the terminal. Works just like any park and ride in a city centre. Normally the most cost-effective option but with a 10-30 minute transfer. Prices starting from just £3.44 per day. Better named "Parking in the airport grounds". If you do need to use a transfer bus, it will have a short journey time. The mid-range option and a compromise between distance and price. From as little as £4.50 per day. The easy one, where you take your car to a drop-off car park close to the terminal and leave it with a driver who will park your car for you in a nearby car park, whilst you go straight to check-in. You will be met and greeted by our staff, hence the name. Great for families with kids but a bit more in price than our Park & Ride car parks. As affordable as £4.61 per day. 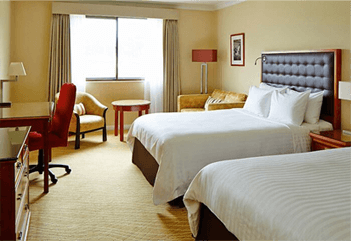 The bonus 4th airport parking option to consider is an airport hotel with parking. Our combined packages start at just £33, which works out at just £4.12 per day for 8 days parking (plus a comfy overnight stay, of course). You'll save a stack of money when you book your airport parking and hotel together, compared to buying both separately and it's often not much extra to opt for a combined package v.s parking on its own. For example at Gatwick, you can enjoy the 3-star Ramada Crawley and 8 days parking for just £60 (only £24.01 extra than just parking alone) and that covers everything; your room, overnight parking at the hotel, parking while you're away and cancellation protection. No pesky additional charges for transfers or anything else for that matter! At Holiday Extras we know that all you savvy travellers out there are looking to bag a great deal on your airport parking. So, we've put our 35 years in the biz and our strong relationships with many airports and trusted parking operators to good use, to offer you some exclusive perks. At the top of this page select your airport, enter your dates, click 'Search' and we'll return all of the parking options available. If there are free spaces, our exclusive packages will be displayed. Simply click 'Book Now' to continue with your booking. Jetting off for a winter escape? 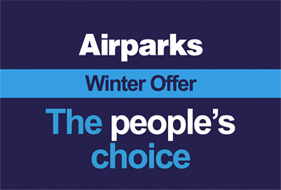 Save 10% on your parking at Luton Airparks and Birmingham Airparks with our exclusive Winter Offer. Enter your airport and dates, hit 'Search' and our 'Winter Offer' packages will be clearly shown in the results page if they're available. Simply click 'Book Now' to continue with your booking. When it comes to airport parking we have a boot-full of options; bargain Park and Rides, official on-airport parking and stress-free Meet and Greets, so we understand it can be a bit tricky deciding which type of service to choose. To give you a bit of inspiration we've listed the top 3 airport parking options at some of the biggest UK airports. These are the high-five worthy car parks that our customers are coming back to, time and time again. That's easy! We offer the best deals we can, the best car parks we can find and the best support with your booking. We've been selling travel extras for over 35 years, so we know what we're doing and we know exactly how to help you travel better. *From just £1.29, our cancellation waiver protects you if you do need to cancel your booking - you'll get a full refund, as long as you cancel up to the day before your booked arrival date. We even boast a 10% discount for all our new customers. Persuaded? At the top of this page, on the left hand side, there's a form with a few clickable boxes. That's our booking engine. Simply enter your dates, select your airport and give 'Search' a click. This will give you a whole range of options to choose from, with prices and detailed information. Our customer support line is the pride and joy of the business. We're at your side for every question, worry or change you have or need and we're pretty darn good at it too. According to you, our friendly, expert travel consultants do such a great job 99.88% of you are happy with our service. In fact, over 6 million travellers have booked their airport parking with us in the past three years, with 1,225,535 of those rating our airport parking as 90% satisfaction out of 100. Seen a couple of airport parking deals that you think might be suitable? Compare parking packages side by side right here on our site by using our handy comparison table, with prices, location and customer rating scores. You can find these tables on our dedicated location pages, so if, for example, you want to compare airport parking at Gatwick head to our Gatwick page. 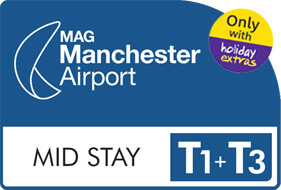 If it's Manchester airport parking you're after, you need our Manchester page. I want the cheapest airport parking possible! No problem! We've got some great budget parking options for those looking to spend as little as possible. To find the cheapest car parks at your airport, check out the top of the list of car parks on our location pages. We've sorted the list by price so the cheapest option will be right at the top. You can also find more information, hints and tips on our cheap airport parking page. We make sure every customer has the opportunity to leave a review about their experience using our airport car parking services. Read the reviews below to find out exactly what other customers like you thought about our parking. Last year 1.2m customers booked their airport parking with us, and 99.88% of Holiday Extras customers say they are happy with our service. Our customers rated Holiday Extras airport parking on average 9/10 (343054 reviews). Read Holiday Extras airport parking reviews. As in the past, this was a fast, reliable service that took all the hassle out of airport parking. I really recommend these guys. They have perfected a slick operation. We'll be back! I always use holiday extras for airport parking, they make it so easy. Good prices, and really easy to use. We all like to get a bargain on our purchases, so why would your parking at the airport be any different? So, how can you get a discount on your Holiday Extras parking? Take a look at the advice below to help shave off even more pounds from the cost of airport parking charges. We'll let you in on a secret. If you're a new customer and you sign up for our emails, you'll get an exclusive 10% off your first booking. Sign up here. Pre-book your parking like a pro. This can and will save you a lot of money. Airport car parks charge a premium for turning up on the day, so booking online can save you up to 70%. Book as early as possible. Some car parks offer really special rates if you book in advance, so the earlier you book, the more likely you are to find one. If you do find one, book it there and then as these rates don't last forever and can be like gold dust! Choose our non-flexible deals. Holiday Extras have many 'non-flexible' deals for all our top car parks. You can't cancel or change your booking, so make sure you're certain of your arrangements, but they do offer an excellent reduced rate on the final price. Consider our park and ride options. Airport parking that is located outside the airport boundary can be significantly cheaper but offers a similar service. Ironically, the transfer times for off-airport car parks can sometimes be less than the on-airport transfer times, due to their location, so make sure you check. We want to provide the very best prices possible. We never want to be under-cut by anybody else and, as such, we offer to refund the difference if you find the same product for less within 24 hours of booking with Holiday Extras. Read about our Never Beaten on Price policy. We try really hard to keep the jargon out and the good stuff in but occasionally a few slip the net. Just refer to this glossary if you get stuck. Valet airport parking: Another term for Meet & Greet airport parking services. Holiday airport parking: Refers to parking at the airport during holiday periods. Usually defined by the period of peak holiday time from March until October. Off-airport parking: Any parking that's not within airport boundaries. This tends to be park & ride car parks.